What is a single mattress size? How big is a double size mattress? What is the width of a king size mattress? These questions always occur to us when shopping for a bed/mattress. Mattress & Bed sizes have standard sizes which vary from country to country. Dimensions and names for standard sizes vary too. Each country has their own standards and terminology. 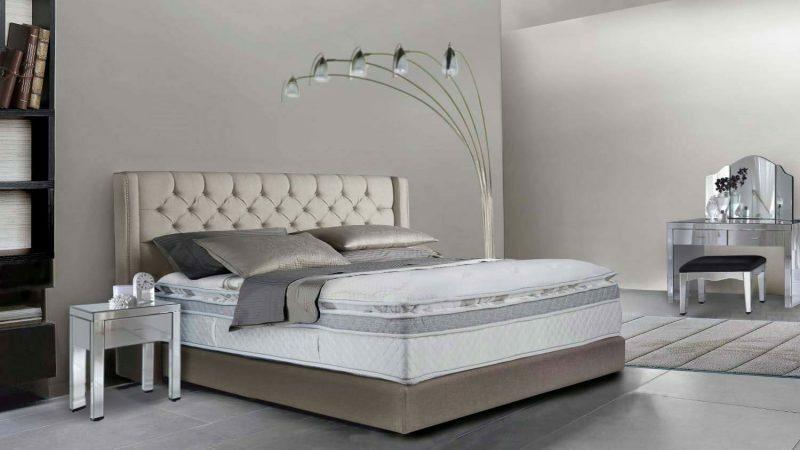 Additionally, two mattresses with the same size may have slightly different dimensions due to manufacturing, amount of padding and support type. One of the most important aspects of a good night’s sleep is ensuring you have enough comfortable room to fully relax and sleep. It is important to consider the actual amount of sleeping space you will have available for a new mattress. Generally, a mattress should be longer and wider than the amount of space you and your partner use to sleep. A common mistake in purchasing a bed is buying one that is too small. Before you start shopping, ask yourself if you are satisfied with the amount of sleep space in your current bed and review mattress size charts below to ensure you purchase the right bed size. Also, mattress sizes should be slightly less than the bed size, to fit inside the bed’s frame. 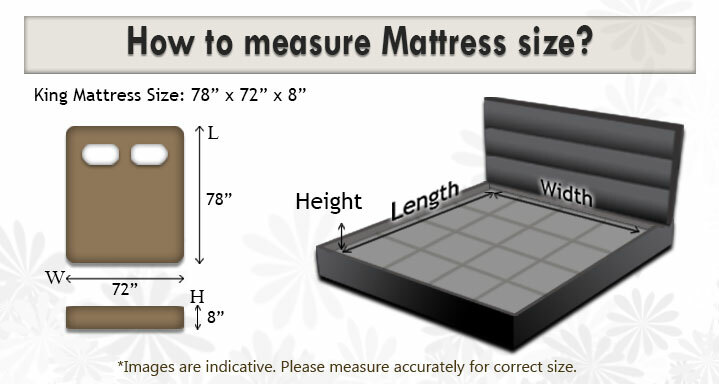 Beyond personal preference, there are various other factors to take into account before picking a mattress size. For example: How big is your bedroom? Do you share the bed with a partner or pets? Is living space or sleeping space more important to you? We’ve explained and illustrated all standard mattress sizes to give you a better idea about which mattress is appropriate for you. Note: The recommended size for two adults to sleep on is a Queen or King. 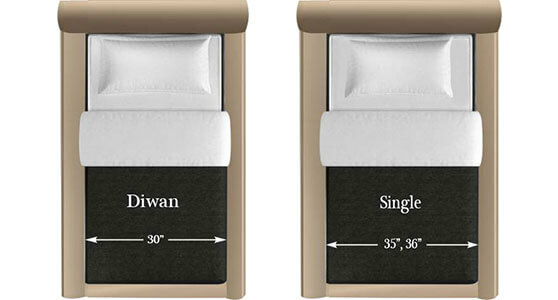 The Diwan and Single sizes are generally made to accommodate one child or one teenager sleeper. Ideal for children, teenagers. The Super Single and Double sizes can accomodate a child, teenager or one adult sleeper. On occasion when you need to lay with your child it should accommodate, but will be a bit crowded. The Double size was commonly used for two adults 30 – 40 years ago when the homes and bedrooms were built much smaller. Now it is usually purchased for single person use and sometimes smaller guest rooms. It is a tight fit for two adults. TIP: If you want to purchase a double size mattress for two adults, remember that this mattress size will only give each person approximately 27 inches of sleep space. This is almost equivalent to the width of a crib. The Queen & Super Queen are the most popular sizes sold. It is ideal for two adults who don’t want a king size in order to save living space or just like to spread out. 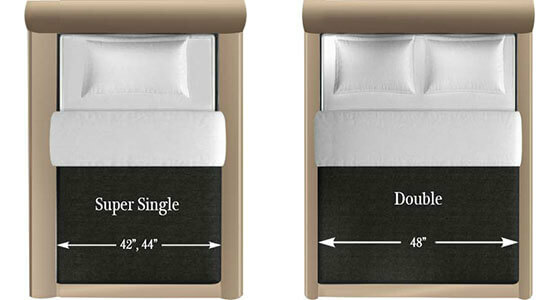 Queen size mattresses provide more width than a double size mattress, which adds additional comfort for two sleepers. 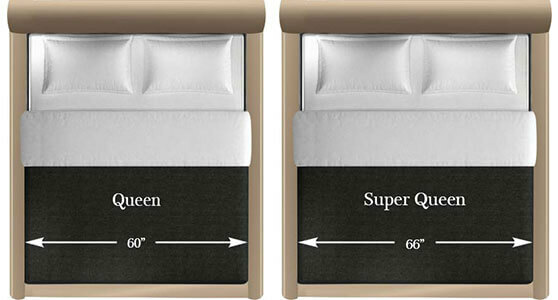 Queen mattresses are the most popular mattress size today. The queen size mattress is a good choice guest rooms or couples that like to sleep closer together. King size mattresses are best for couples that want the maximum amount of sleeping space. The size of king is much wider than queen (about 12″ – 16″). If you have the space it offers the most room for couples. King size beds are also great if you have kids or pets Super King which is about 84″.